The Regiment needs your help. Support to the families of those killed in action by responding promptly to problems of bereavement and hardship. Support to those wounded on operations, particularly those who have had to leave the army; to assist in finding them new employment and to help them become active family and community members. Support to the families of those seriously wounded or injured in prolonged recovery situations. 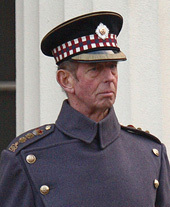 The Regimental Trustees have wide discretion to use the Colonel’s Fund to enhance the welfare of Scots Guardsmen on operations and that of their families at home. Furthermore, they will be able to use capital as well as income if they deem it necessary. The rate of operational deployments and the nature of those deployments has resulted in a much higher casualty rate across the Army – fatal and non fatal, physical and mental – than has been since the Falklands Conflict. Some mental casualties will not become apparent for many years, even decades. As an Infantry battalion the Scots Guards are likely to find themselves among the most frequently deployed parts of the British army. Immediate and short term duty of care lies with the Ministry of Defence, and thereafter with appropriate Government Departments. 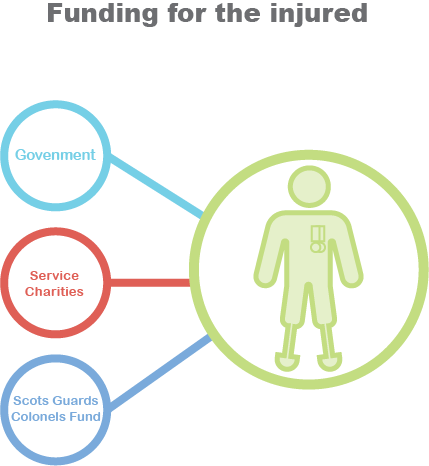 There are also a number of charities, such as SSAFA, the Army Benevolent Fund and Help for Heroes that do much to support wounded soldiers and their families. But some of the necessary welfare support, both immediate and long term, will always have to be provided from our Regimental charitable funds. Operational commitments will unfortunately place significantly greater demands on these already fully committed funds than the Regiment is likely to be able to provide. As a family regiment the Scots Guards is determined to be in a position to provide the necessary support for all members of the regimental family, now and in the future. To be in a position to do so the Regiment needs to raise a substantial sum of money. It can only do this with your support. The Colonel’s Fund will make a real difference to the lives of Scots Guardsmen and their families in the future. It is thus your opportunity to really ‘make a difference’. The Scots Guards are among the Army’s first soldiers of choice on operations. They have already seen active service in Iraq and Afghanistan, and will be called upon again. We need to be prepared as a regiment to shoulder responsibility for a larger number of long-term casualties than we have experienced for a very long time.